Obtained in the steam distillation of twigs and leaves of the Eukaliptus Globulus tree. It has antibacterial and antiviral effects. It is used in the treatment of upper respiratory tract infections, runny nose, cough, sinusitis, and rheumatic pains. Eucalyptus oil stimulates the immune system. It relaxes the bronchi, liquefies residual mucous secretion and clears the nasal sinus. He refreshes the mind in case of a cold or hay fever. Perfect for insect bites (relieves itching), burns, wounds, and blisters. It has an expectorant, anti-inflammatory and disinfecting so it is often used for inhalation of air. Effectively decontaminates rooms in the event of an infection or an infectious disease. Calming, supports cellulite removal, anti-depressant, anti-infective, antiseptic, fungicidal, anti-inflammatory, toning, relieves premenstrual tension. Cedar, lemon, lavender, tea tree, mint, thyme, pine rosemary. Avoid contact with eyes. Do not use it if you suffer from high pressure. Use always in dilution. Store in a tightly sealed dark glass bottle at room temperature out of the reach of children. 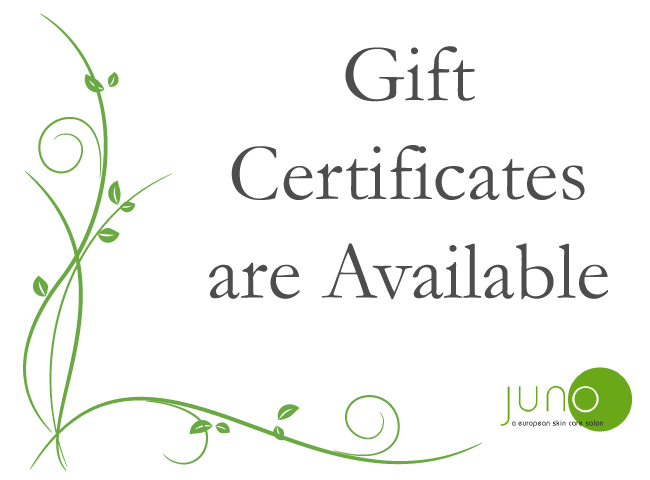 Give someone you care about the perfect gift — a Juno Gift Certificate. At our exclusive Skin Care Salon, we offer you a number of ways to pamper your loved ones, from luxurious facials done in the traditional European style, to eyebrows, lashes and more. You might also consider giving our amazing skin care and health-related products. Juno offers the same exclusive products we use in our facials for home use. You will want to check out our new products.